Four superstar small business owners didn’t just receive the opportunity of a lifetime by meeting with lawmakers to find solutions to pressing small business issues at our inaugural Small Business Leadership Summit in the nation’s capitol earlier this month, they also walked away with prestigious honors, and some nice hardware to boot. 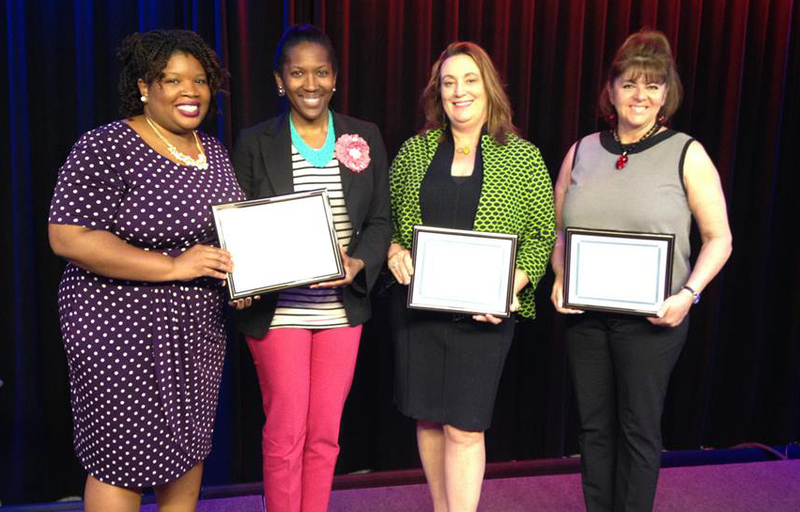 Virginia McAllister, Beverly Hanstrom, Chancee Lundy and Veronica Davis were all honored with small business leadership awards at a reception in Google’s D.C. headquarters on May 12, a ceremony that bookended the second day of Small Business Majority’s Leadership Summit. McAllister owns Iron Horse Architects, an architectural firm based in Denver, CO that centers on the principles of sustainability, adaptability and longevity. The company has been at the forefront of implementing Building Information Modeling (BIM), which facilitates the planning, designing, constructing and managing of buildings and infrastructure at a digital level. Through McAllister’s use of innovative technology to grow her business and break ground in her industry, she was awarded our Technological Innovation Award. Chancee Lundy and Veronica Davis co-own Nspiregreen, a D.C.-based environmental consulting firm with an eye toward serving their community. They engage in extensive outreach to ensure the voices of disadvantaged residents are heard in decisions on planning infrastructure projects. Outside their business, Davis launched “Black Women Bike,” an organization that gives women of color a voice at the infrastructure policy table, while Lundy serves on the board of Together Restoring Economic Empowerment, a nonprofit dedicated to helping minority communities tackle economic and environmental civil rights issues. For their personal and professional commitment to serving their community, Davis and Lundy received our Community Development Award. Beverly Hanstrom owns Colorado Medical Waste, a local leader in medical waste disposal offering services for everything from collection and transportation to treatment and incineration. She incorporates a process known as ozone medical waste processing which utilizes ozone, electricity and an industrial shredder to reduce medical waste volume by 90 percent while diverting tons of waste from landfills with absolutely no emissions resulting from the process. For her environmental consciousness and business practices, Hanstrom was awarded our Sustainability Award. There you have it: four creative and innovative small business owners who are doing their best to become the leaders of tomorrow. We couldn’t have been more thrilled to honor them with these accolades, and have them be among the 100-plus business owners in attendance at our Summit.